Key To The Highway: Interfaith Issues ... Gimme a Break! Biggies has compiled the news nicely for us on the Federal Court's rejection of Azlina's application. Refer here and here. I love to write on it at length (but not in mood yet) on this Azlina Jeilani and various Islam bashing issues (but claimed not to be so and merely) camouflaged (as I see it) as a civil liberty issue. This bloody apostacy and interfaith issues are just pure humbugs! If she wants to convert out, get the clearance from Syariah Court. Thats the rule. Abide by it! They say follow God rule. She is baptised already, so Syariah court doesn't apply? In the case of Muslim women under detention at a faith rehabilitation centre that married a Hindu and have kids, they say its inhuman to deny her to her family. She is a Muslim, isn't it? Now its humanitarian issue? Suzy Teo converted to Islam below legal age but met Islam's baligh and berakal age. Lost in the court for she is a minor. No to God's law but court's law? Where is it about her freedom to profess her chosen religion? IFC not adjudicatory but the fine line says the state has to listen to their recomendation. What the f**k these lawyers think we are? Stupid? Blind? All these Xenophobic prick with hidden hands workign in concert! If these are private issues, why is the American based Beckett's funding her defense and expensive legal team? Why is some I called certain deviant Muslim groups getting Konrad Adreneur Foundation's funding and assistance? Why is Singapore sympathiser New Straits Times and Sun giving much voice to those super liberal Muslims and refuse the right of replies by progressive and more authoritative Muslim groups? However, I am not without compassion. The Subashini's case is a tragedy. I felt the husband or precisely the ex-husband lacked finesse. Why did he force his faith on the kids? Preach it to them with kindness and wisdom. Anyway, this is a family matter, sort it. Why revert to lawyers? The way I see it. All this interfaith issues are tragedies we inherited from the colonial legal tradition. If as Malik Imtiaz says, secular court is superior to the syariah court, he should be reminded that the syariah court exist more than 460 years ago here. Respect that! We have to find resolutions to this differences. Legal avenue is not a solution for it is adversarial. Forcing a choice only makes one side happy. Whoever lawyers claim they are embracing humanity are just hogwash. They only love a good fight! They are the ones who created all these interfaith quarells, be them Muslims or otherwise. Political approach will not make it any better. The might is only right. Anyway politician have no balls to takeup a sensitive issue like this. The opposition would perhaps liek to take it up but its more for political mileage. Lets return society's problem back to society for resolution. Let the conversant "man of cloth"s sit together to resolve it. They are all good people. I hope the men and women of religion resolve it amicably and consistent with each other's faith. There should be a way and a way must be found. One classic Gershwin song had a fun phrase to describe minute irreconcilable differences between a couple. 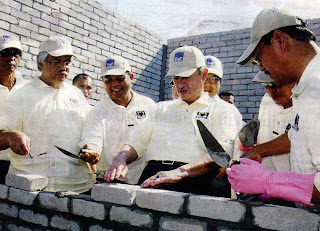 When Pak Lah took stewardship of this country, he spoke at the top of his hoarse voice at his first UMNO General Assembly (GA) in 2004 as President on a Malay (Economic) Agenda. 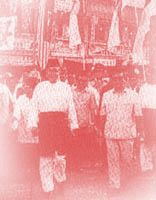 Subsequently, Malay Agenda became buzzword at Malay intellectual and political discourses and brought a renewed sense of excitement amongst those concern for the fate of the Malays. In 2005, Khairy came out with the words “kesinambungan semangat DEB”. Then, the GLC was taken into the spotlight that year for not playing their role or in their corporate buzzword “KPI” had no Malay Agenda. At UMNO 2006 GA in November, the GLC was again taken to task. Khairy again took the GLC to task. Come March 25th, 2007 in an Utusan Malaysia article, he turned defensive to explain the GLC transformation and quote a so-called turnaround like MAS. He began to renegade from his earlier years ranting on Malay Agenda and GLC by doing an overview of the issues and its dilemmas. The best he could say was a no solution to an already 3-year discussion with “Jalan penyelesaiannya banyak bergantung kepada kebolehan GLC untuk mengimbangi tuntutan urus niaga dan juga matlamat Agenda Melayu dengan bijak.” Ah well! That Khairy! As one quite aware of his conniving moves with his non Malay proxies, particularly in ECM Libra and AirAsia, any of his words needs not just a pinch of salt but lots of it. When Maybank, as a GLC Company, which is not Khazanah but Malay Trustee PNB controlled, attempted to assist Malay lawyers, the expected hue and cry from non Malays is heard. DAP made an issue out of it and MCA did the whispering from inside. The UMNO President and claimed proponent of Malay Agenda flip to the coordinated pressure then flop from it as brave cries from several UMNO personalities began to response. That tells so much of his ability to grasp his own words. But where is Pemuda UMNO’s voice? Where is the voice of Mr “Kesinambungan semangat DEB”? Where is the movement that back in the 80s were monitoring and ensuring that Companies abide with the DEB and even pushing for employment for Malay graduates ? Since AirAsia is touched, it is widely known that MAS is to be slaughtered for AirAsia and MCA’s Minister of Transport … opps Minister of “Hal Ehwal” AirAsia will make sure it happens. MAS will seemed to be turning around so Idris Jala looks like doing a good job but he is actually just retrenching staff and fancy reappropriating asset sales as operational profit. He sold office, hotel, and any asset he could get his hand on. Whats left? The motherf**ker to takeover Idris Jala’s job is in for a major f**k. Oh well, some of those MFs, like one GM named Zulaifah is a Singaporean. One wonders how many more of those Singaporean, AirAsians and non Airliner consultants at top management level planted to run MAS to the ground and six feet under? Not to be left out, an AirAsia lawyer is due to be employed. There is already an AirAsia “lawyer” heading revenue management and planning. That lawyer must be a born natural mathematician to manage operation research outfit? As for Tony Fernandez, Khairy’s futsal kaki, he will get his way with routes and everything else. The red dot down there that the current administration seemed to have renewed friendship with will benefit with an open sky policy and opening of the KL route. Tony wanted the Rural Air Service (RAS) and he got it for FAX. In early January 2007, he also got FAX the license to be the new long haul air service for AirAsia-X for supposedly non MAS long haul routes. Why would Tony want those MAS’s routes said to be non profitable? Conveniently, Tony cashed out to maintain his investment portfolio cashflow as AirAsia, the PLC buys 20% in FAX. In March 2007, their Minister announced expansion of the LCCT for AirAsia’s growth. He gets it his way again. MAS announced in mid March 2007 a new budget airline subsidiary, Firefly. It will operate out of Penang to cover Kota Baru, Kuantan, Kuala Terengganu, Penang, Phuket and Kok Samui, Thailand. Coincidentally, FAX decided to end its RAS arrangement with Government and MAS or Firefly is supposed to takeover that operation. Tony just realised its not a very profitable routes and let MAS have it. Tony gets it his way big time. I guess we have to live with Oxford’s lesson on corporate turnaround taught to Khairy. Lets hear now of how Khairy’s perception of GLC’s role and balancing act to incorporate Malay Agenda. I’ll not talk of opportunities to be vendors for Malays but just focus on employment. Who doesn’t know that MAS as a GLC has been providing opportunity to Malays for employment? It is beyond just employment but aerospace is one area that Malay have a distance edge in. That’s opportunity and hard work. After Minister for AirAsia Affairs has denied plans for retrenchment on November 16th, 2005, a massive purge occurred as experienced and competent Airliners became “mangsa”, as described by the MAS Staff Union President a day earlier. Now, MAS has lost a lot of good people to other Airlines and not to mention it cost a lot of money to MSSed them. PM got the cheek to ask MAS to train more pilots to replace those leaving to other countries. With all these going ons, he actually used to say Malaysia to be an aerospace country by 2015. Is he talking in his sleep? MAS is not creating employment but when there is, it is discriminating against Malay and also other races. Firefly is now about to get into operations and doing its hiring. Thats when I was texted of this disturbing information on their job ad in their website http://www.fireflyz.com.my/. The "agile, brilliant, charm and fun" new Airline of MAS under their CEO, Eddy Leong are looking for pilots, management trainee and stewardess. The sickening part is requirement of good command in Mandarin mentioned as advantage. When it is mentioned, the practise is that they want Mandarin speaking applicants. What does that tell for Malays, Indians and other races? Go, don’t even try! What puzzles me are: With that kind of operation, why do you need stewardess with that kind of language competency? Why do you need Management Trainees with that kind of language competency? Do you need it to serve Peninsular capitals and Thai resort towns? The ad says it already expired on April 7th, 2007. How many non Chinese actually applied? How many got it? Now on 31st Mei 2006, Human Resource Minister, Dato Dr Fong Chan On in his comment to an earlier comment by Dato’ Seri Najib a day earlier already said, hiring with Mandarin requirement is lop sided and unfair. What is Pemuda UMNO going to do to this blatant racism? What is Khairy going to say of this discrimination by GLC on Malays it is supposed to have an Agenda for? Are we to hear again more chant of Malay Agenda from Khairy again? Now will the much hue and cry over Maybank’s affirmative action assistance as racist be heard of Firefly’s hiring practise? There should be but I am not hopeful. In the inner MAS circle, Firefly is the “standby” future management of MAS. With nearly all of current management committee of MAS speaks Mandarin, it is now the way forward. Perhaps, all of them have discuss it at the Minister's office. Ah! The China factor! Does the the name John Toh and Vincent Leong sounds China or Malaysia? Lets call this Malay Agenda charade off! This tune is for Pak Lah and Khairy. Tulisan dan rumusan Husin Lempoyang, blogger satira yang bisa marah di blog 13 Mei: Dari Kacamata Melayu mengenai pertalian buku kontroversi "May 13" dengan Singapura dan kuasa Neo-Kolonialisma adalah satu peringatan baik memandangkan senario keakraban pentadbiran Abdullah Ahmad Badawi dengan Singapura sekarang. Ikuti tulisan beliau seterusnya. Buku "May 13" agak berlainan dari proses ilmiah biasa. Ianya seolah-olah tulisan yang mempunyai pre-set rumusan dan kesimpulan , serta mempunyai niat provokasi . Bila diambilkira latarbelakang penulis Dr Kua Kia Soong  dan senario semasa, kehadiran buku ini bukan secara kebetulan. Kesunyian media Melayu terhadap buku ini memusykilkan. Adakah tiada langsung yang terbuka ijab dan mata hati untuk menyedari konspirasi ini? Adakah tiada langsung suara hati yang prihatin kepada kesejahteraan antara kaum? Mungkinkah "elegant silence" untuk menutupi kepincangan diri seseorang telah dipaksa ke atas yang lain? Buku tersebut memajukan hipotesis bahawa Tun Abdul Razak ("Tun") merancang rusuhan kaum agar darurat diisytiharkan untuk rampasan kuasa kononnya bagi mengetengahkan kepentingan kelas kapitalis Melayu baru. Asas hipotesis bagaikan konspirasi kerjasama antarabangsa bila diamati sumber rujukan yang merupakan laporan berita wartawan asing, dispatch rahsia kedutaan asing, dan tumpuan rujukkan kepada yang sehaluan pemikiran. Sumber rasmi dan maklumat dari orang Melayu yang digunapakai sebagai rujukan amat sedikit. Penggunaan terma-terma seperti "class struggle", "capitalist class", "state capitalism" dan "state apparatus" memberi gambaran Dr Kua mengambil pendekatan Marxisma . Adakah pendekatan tersebut sesuai untuk masyarakat dan sejarah tempatan? Bukankah penumpuan Tun kepada pembangunan luar bandar jelas untuk membasmi kemiskinan? Buku ini hanya mengadudombakan Tunku Abdul Rahman ("Tunku") dengan Tun dalam sejarah . Siapa tidak sedar Tunku telah di ikonkan oleh pihak tertentu sebagai lambang dan conscience kesamarataan antara kaum. Tuduhan coup d’etat akan menggambarkan Tun sebagai kapitalis yang tamak dan rasis. Tuduhan terhadap Melayu begitu ketara – pemimpin Melayu, askar Melayu, polis Melayu, dan "gangster" Melayu kononnya . Intipatinya Melayu saja yang salah. Bagi menjana tuduhan, buku ini hanya mengambilkira persekitaran dua tiga hari sebelum dan beberapa bulan selepas peristiwa . Padahal sejarah perhubongan kaum di Tanah Melayu bermula dengan immigrasi abad ke 19. Dr Kua sengaja in-denial kepada perkembangan politik beberapa tahun sebelum itu. Dari tahun sebelum kemerdekaan hingga 1962, semangat kerjasama kaum perikatanisma telah diterima baik oleh rakyat. Keadaan mula berubah dengan kehadiran Singapura yang menjadi ahli Persekutuan Malaysia pada September 1963 atas syor Tunku. Kehadiran Lee Kuan Yew ("LKY") dan PAP dengan slogan "Malaysian Malaysia" dalam politik Malaysia meniup api perkauman , kononnya memperjuangkan kesamarataan kaum. Perkara taboo berkaitan orang Melayu dilanggar. LKY melampaui hingga mempersoalkan status Melayu sebagai kaum asal Tanah Melayu di Parlimen. Padahal perkara-perkara ini telah dipersetujui dalam tawar menawar untuk menerima kaum immigren yang bermastautin sebagai warganegara. Ini menimbulkan reaksi marah dari orang Melayu yang begitu kekurangan serba serbi dan menganggap kaum immigren memungkiri janji yang telah dinobatkan dalam Perlembagaan. Sejak kehadiran Singapura, perhubongan antara kaum menjadi tegang  dan rusuhan antara kaum mula berlaku. Sebelum 13 Mei 1969, dua peristiwa yang ketara - rusuhan kaum Singapura pada Julai 1964 dan peristiwa hartal Pulau Pinang pada November 1967 . Pada Mei 1965, Singapura menjadi tuan rumah mesyuarat pertama gabungan "Malaysian Solidarity Convention". Konvensyen itu menyatupadukan parti-parti pembangkang dari kaum tertentu di bawah slogan "Malaysian Malaysia." Tun Tan Siew Sin dilaporkan Utusan Melayu bulan Julai 1965 mengkritik "Malaysian Malaysia" sebagai usaha menjadi "juara orang Cina" dengan membangkitkan kemarahan keatas orang Melayu. Menyedari bahaya kehadiran LKY dan PAP, Tunku berpatah dari keputusannya dan menendang Singapura keluar pada tahun Ogos 9hb, 1965. 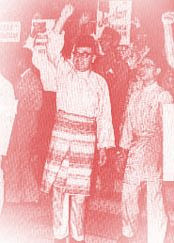 Tindakan Tunku tidak meredakan keadaan kerana isu perkauman sudah ada momentum hingga menjadi tajuk hangat kempen pilihanraya 1969. Akibat sentimen ini, prestasi MCA dan penguasaan Perikatan dalam Parlimen dan Dewan-Dewan Undangan Negeri terjejas selepas pilihanraya tahun 1969. Pembangkang menjadi "mabuk kemenangan" hingga meraikan perarakkan dengan menghina orang Melayu. Inilah pencetus reaksi amuk dari orang Melayu, bukannya konon komplot UMNO  . Kalau mahu ikhlas membicarakan sejarah, janganlah berpileh-pileh. Sejarah tidak boleh diputarbelit (spin)   kerana ia berasaskan kebenaran. Peristiwa Mei 13 jelas bukan peristiwa berasingan seperti yang diunjurkan oleh Dr Kua tetapi berpunca dari perasaan tidak puas hati yang dikipas untuk membakar dan merebak. Peranan Singapura di sebalik tabir tidak boleh dinafikan. Neoimperialisme menjelma dalam pelbagai bentuk dan rupa. Ia boleh menjelma dalam membentuk "aggression" dan peperangan secara terus-menerus. Ia juga boleh menjelma dalam membentuk "subversion" yang halus dan secara tidak langsung. Sebab itulah dunia hari ini sedang menyaksikan berbagai-bagai percubaan oleh segolongan bangsa Eropah untuk menakluki sesebuah negara, secara langsung atau tidak langsung. Oleh itu, kalaulah bangsa Eropah tidak mencerobohi negara kita dengan kekerasan, ini tidak bermakna mereka tidak berusaha meracuni pemikiran kita, melunturkan budaya kita, mencemarkan agama kita dan mengadudombakan lain-lain aspek kehidupan yang membabitkan keselamatan, keamanan dan kesejahteraan bangsa Malaysia. Dendam Singapura terhadap Malaysia tidak pernah luput. Kini mereka lebih kuat dan kuasa neo-kolonialis barat yang bias terhadap Islam menyebelahi mereka. "Barbarian" sudah menunggu di pintu gerbang dan kuda "trojan" sudah masuk kota. Tinggal menunggu masa sahaja. Beberapa persamaan antara tahun 1969 dan keadaan sekarang telah timbul. Isu-isu mengenai orang Melayu – hak keistimewaan, bahasa, pendidikkan, agama, tindakan afirmatif dan lain-lain – kini hebat dipersoalkan. Pengaruh luar dilihat memainkan peranan dengan bantuan disalur dari dana, Yayasan dan NGO tertentu. Orang Melayu, khususnya kaum menengah dan peniaga, mengeluh dengan pentadbiran sekarang yang lemah serta mengamalkan polisi-polisi reform dan pengurusan ekonomi yang regresif. Kalau dahulu LKY menggelar Tunku sebagai "…silly old man" kerana sikap baik hati dan adilnya, pemimpin kini benar-benar demikian. Ia begitu cuai dan naif hingga dimanipulasi oleh kaum muda sekelilingnya yang bertuan yang lain. Mereka serta orang-orang tertentu berperanan untuk mempertingkatkan hubungan baik dengan Singapura. Kini pengaruh Singapura dalam ekonomi, pentadbiran, politik, dan media sudah dirasai. Hanya menunggu pelaburan Singapura untuk mengukuhkan. Padahal negara-negara jiran lain sudah menyedari reputasi Singapura sebagai jiran yang opportunis dan memperjuangkan kepentingan barat. Yang anih juga, sebahagian kaum bukan Melayu menyambut kemasukkan mereka. Ada dikalangan orang Melayu membisu takut walaupun menyedari bahayanya. Kehadiran buku "May 13" dan banyak buku-buku yang mahu mengubah sejarah mutakhir ini tumbuh bagaikan cendawan. Buku-buku ini memberi gambaran yang baik akan pendekatan pemerintahan dan pendirian Singapura. Yang nyata, buku ini boleh mengipaskan perasaan tidak puas hati dikalangan kaum bukan Melayu dan cuba meraih simpati dari orang dan anak Melayu berpendidikkan barat yang agak liberal  . Apakah reaksi orang Melayu terhadap serangan-serangan kepada kedudukkan mereka? Adakah orang bukan Melayu termakan dengan dakyah sedemikian? Adakah pertempuran kaum akan berulang kembali? Muga kewarasan fikiran mendahului. Apa Yang Mereka Mahu Sebenar? Perkara yang menjadi saya amat terkilan sekali dengan penerbitan Buku “May 13” adalah lakaran racis dan bolot yang melulu dan stereotaip terhadap usaha pemimpin lepas untuk membetulkan legasi yang telah dibawa oleh British. Kalau dikaji sejarah negara ini, persoalan dan perjuangan penulis buku ini, Dr Kua Kia Soong terhadap kedudukkan keistimewaan Melayu, bahasa Melayu, agama Islam, dan lain-lain hak-hak legal dan warisan sejarah orang Melayu bukan perkara baru. Slogan politik “Malaysian Malaysia” bukan slogan baru tapi berakar umbi pada slogan cetusan Tan Cheng Lok “Malaya for Malayan” pada 1930an, di kemuncak polisi immigrasi tanpa had British. Sekolah Cina yang diperjuangkan dengan gigih oleh Dr Kua Kia Soong, penulis buku ini pun asalnya sekolah sukatan pelajaran negeri Cina yang dibenarkan oleh British untuk memenuhi keperluan pelajaran anak-anak immigren untuk pulang kembali. Mengapa sudah jadi rakyat pun mahukan legasi pelajaran immigren? Adakah tujuan kononnya perjuangan kemanusiaan sejagat SUARAM membawa kepada pembangunan negara (nation building)? Biar saya katakan rekod beliau menunjukkan sebagai seorang “xenophibic ethnocentric”. Sifu saya seorang sosiologis baru menghantar komen SMSnya, "Same thesis as his earlier book. 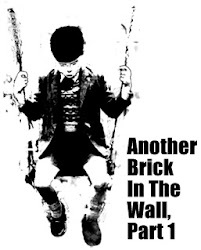 Strait jacket mechanical application of Marxism." Ingin saya seterusnya memetik rencana tulisan Dr Nordin Kardi, bekas Pengarah Biro Tatanegara dan kini Naib Canselor Universiti Utara Malaysia (UUM) dari Utusan Malaysia yang diterbit dalam lingkungan tarikh Mei 13hb, 2007 baru-baru ini. Rencana bertajuk “Fahami pemberian orang Melayu” ini saya “potong dan tampal” dari rakan blog rakan karib saya, Biggum Digmannsteinburg. "Pemimpin-pemimpin Melayu terutamanya sangat defensif dalam menguruskan masalah kepentingan kaum ini. Kadangkala di Parlimen, ahli-ahli Yang Berhormat Melayu di pihak kerajaan seperti begitu ofensif dalam serangan balas mereka atas tuduhan perkauman. Namun, nyata tindakan ofensif itu pun hanya merupakan sebahagian daripada strategi defensif. Seperti ada rasa bersalah di kalangan pemimpin Melayu setiap kali bercakap mengenai kepentingan etnik sehingga ruang rundingan kepentingan Melayu terutamanya tidak begitu terbuka, sebaliknya perlu ‘diseludup’ dengan cara lain. Pemberian terhadap orang Melayu secara terbuka ditakuti akan dilihat sebagai tindakan diskriminatif." Permasaalahan kaum yang berlaku pada 13 Mei 1969 berakar umbi dari amalan “pecah dan perintah” British yang menyebabkan rakyat berbilang kaum dipisahkan antara satu sama lain melalui bahasa, pekerjaan, ekonomi, penempatan, dan lain-lain cara. Dari situ timbul jurang perbezaan dan syak wasangka yang amat mendalam antara satu kaum dengan satu kaum yang lain. Berbalik kepada perkara pembangunan negara, saya bersyukur dapat diperingatkan jasa arwah Tun Abdul Razak oleh Tengku Tan Sri Razaleigh bin Hamzah pada Mac 30hb, 2007 baru-baru dalam ucapannya bertajuk “Pemikiran dan Visi Tun Abdul Razak dalam pembinaan negara-bangsa Malaysia merentas semadan etnik” di Universiti Malaya. Langkah-langkah strategik Tun Abdul Razak begitu berkesan dalam usaha “nation building” dalam aspek pendidikkan, ekonomi dan sosial . "Frasa popular yang dilemparkan kepada kerajaan semasa ialah bahawa kerajaan perkauman kerana dibentuk oleh gabungan parti utama yang berasaskan kaum – UMNO, MCA dan MIC. MCA dan MIC selalu dimomok sebagai parti bukan Melayu yang yang tunduk dan menjadi alat kepada UMNO untuk menegakkan kepentingan Melayu." Ungkapan Clinton, Its the Economy, Stupid? "Dasar Ekonomi Baru (DEB) yang diasaskan selepas Peristiwa 13 Mei, yang menekankan sasaran penyertaan Melayu sebanyak 30 peratus dalam semua sektor untuk tempoh 20 tahun (1970-1990) adalah ibu kepada segala dasar ‘jahat’ perkauman UMNO. Orang bukan Melayu dilihat sebagai telah berkorban selama 20 tahun untuk membiarkan orang Melayu merebut segala peluang ekonomi, pelajaran, sosial dan sebagainya. Oleh yang demikian sebarang usaha melanjutkan sasaran itu selepas 1990 adalah suatu usaha diskriminasi yang menzalimi kepentingan kaum lain. Pemimpin UMNO selalu mempertahankan keputusan-keputusan berkaitan kaum dengan mengulang-ulang cerita kontrak sosial yang telah lama. Ini berterusan sehingga mata masyarakat Malaysia, lebih-lebih lagi mata asing (mungkin dengan minat tertentu), melihat seolah-olah benar kaum Melayu terus menerus mendapat laba selepas kontrak itu, sementara kaum lain sentiasa memberi. Orang Melayu sudah tidak memberi lagi selepas 1957! Orang Melayu menerima subsidi, orang Melayu membolot kuasa, orang Melayu kaum penerima!" "Bilakah orang Melayu memberi? Besar sangatkah pemberian orang Melayu itu kepada kaum lain sehingga kaum lain terpaksa membayarnya kembali tanpa kesudahan? Tambahan pula kontrak itu bukan dibuat oleh generasi pelbagai kaum sekarang. Dia buatan orang dahulu, mengapa orang sekarang harus terus membayarnya? Benarkah?" "Memang pada tahun 1955, dua tahun sebelum merdeka, orang Melayu telah menghadiahkan sesuatu yang sangat berharga kepada kaum lain. Biasanya, orang akan cepat menyebut bahawa hadiah besar kepada kaum lain itu ialah kerakyatan." Dengan pemberian kerakyatan dan perjanjian yang sudah dinobatkan dalam Perlembagaan, sebagai rakyat mereka bebas untuk mengumpul dan memiliki harta & tanah, mengamalkan bahasa, kebudayaan, dan ugama mereka, dan mereka berhak memilih wakil ke Parlimen. "Itu pun kata mereka kerana pembesar Melayu dipaksa oleh Inggeris. Tidak ada pilihan. Namun demikian, saya lebih cenderung mengatakan hadiah besar itu bukan kerakyatan sebaliknya hadiah selepas kerakyatan itu diperoleh. Jangan lupa, hal ini tidak semestinya terjadi jika keputusan sedemikian tidak dibuat orang Melayu." Mudah mereka terlupa atau sengaja lupa? Atau mereka tidak faham? "Apakah perkaranya? Perkaranya ialah kerusi pilihan raya. Pada tahun 1955 itu diadakan pilihan raya dan orang bukan Melayu hanya mempunyai majoriti di dua konstituen. Namun demikian Almarhum Tunku Abdul Rahman telah memutuskan supaya orang bukan Melayu diberikan 17 kerusi. Lima belas untuk MCA dan dua untuk MIC. Segolongan pemimpin UMNO meninggalkan UMNO kerana hadiah yang terlalu mewah ini. Namun, rupanya orang Melayu. Kebanyakan pun bersedia merestui pemberian hadiah ini. Keputusan pilihan raya itu menunjukkan orang Melayu memangkah untuk berwakilkan bukan Melayu di kesemua tujuh belas konstituen itu. Maksudnya, keputusan itu bukan lagi keputusan Tunku berseorangan. Orang Melayu berani meletakkan kepercayaan dengan berwakilkan bukan Melayu untuk memperjuangkan kepentingan mereka." "Itu dahulu. Sekarang bagaimana? Demikian lanjutan perbualan ahli politik generasi muda. Jawapannya tetap serupa. Semenjak pilihan raya 1955 itu UMNO secara berterusan memberikan konstituen majoriti Melayu kepada bukan Melayu. Jika tidak demikian semangatnya, MIC boleh dikatakan tidak akan diberikan satu kerusi pun. Cuba perhatikan hadiah UMNO kepada orang calon bukan Melayu dalam pilihan raya terbaru iaitu tahun 2004. Ong Ka Ting, Presiden MCA menang di P165 Parlimen Tanjung Piai, Johor yang pengundi Cina hanyalah 40.14 peratus berbanding dengan pengundi Melayu 53.02 peratus. Kawasan itu boleh diyakini sebagai kawasan selamat menang kepada Ong. Naib Presiden MCA, Ong Tee Kiat menang di P100 yang pengundi Cina hanyalah 42.56 peratus berbanding pengundi Melayu 51.42 peratus. Demikian juga dengan pemimpin MCA yang lain bergantung kepada undi Melayu seperti Chor Chee Heung di Alor Star (58.43 peratus), Lim Bee Kau, di Padang Serai (52.51), Tan Kian Hoe di Bukit Gantang (62.95), Yew Teong Lock di Wangsa Maju (52.67), Wee Ka Siong (55.26), Kerk Choo Ting di Simpang Renggam (54.29) dan Ling Ban Sang di Tebrau (51.09). MIC pula mendapat konstituen yang majoriti pengundinya adalah Melayu di Hulu Selangor untuk Palanivel (50.50 peratus Melayu berbanding pengundi India hanya 19.04 peratus) dan Vigneswaran (50.05 peratus Melayu berbanding pengundi India hanya 27.30 peratus." Perkara yang amat kuat dipersoalkan sehingga tuduhan konspirasi coup d’etat disebalik persitiwa 13 hb Mei adalah ekonomi. Kata klise, hidup dan mati orang Tionghua hanya memikirkan dan mengejar duit dan harta. Adakah mereka berhasrat dengan kiasu untuk membolot tanpa kekangan? Mungkin tidak terancang begitu. Siapa tak tahu bahawa mereka memang boleh bersaing? Mereka mahu amat memperjuangkan ekonomi laisse fairre atau ekonomi bebas. Bagi mereka yang sudah maju kehadapan, bermodal dan rangkaian tertutup (exclusive networking) yang tidak lut, tahap competitive advantage mereka sudah teramat jauh di hadapan. Padang permainan ekonomi bukan bagaikan liga bola Inggeris yang membahagaikan mengikut Premier League, Divisyen Satu, Dua dan seterusnya. Orang Melayu memang sudah menunjukkan peningkatan, tapi permainan catch-up tidak boleh menyaingi kadar pertumbuhan mereka. "Dalam konteks ekonomi pula adakah benar orang Melayu sahaja yang menerima sedangkan kaum lain sentiasa memberi? Orang berniaga atau orang yang mempelajari pengajian perniagaan akan faham bahawa dalam sesebuah ekonomi setiap ahli masyarakat menyumbang kepada pertumbuhan. Tentulah tidak munasabah mengatakan Melayu hanya sebagai penerima sedangkan mereka setiap hari berurus niaga dan berperanan sebagai pengguna yang berbelanja. Baik DEB mahupun Dasar Pembangunan Negara (DPN) memang ada memperuntukkan bajet negara atas nama Melayu. Contohnya Felda. Majoriti penerokanya ialah Melayu. Namun demikian, jika katakan kawasan Felda itu adalah getah, peneroka akan menunggu tujuh tahun baharu getahnya boleh ditoreh untuk mengeluarkan hasil. Sedangkan, kontraktor pembina jalan, kontraktor pembuat rumah peneroka, kontraktor memasang paip, kontraktor elektrik, kontraktor membina kompleks dewan, sekolah dan sebagainya yang menelan jutaan ringgit (berbanding beberapa ringgit yang bakal diperoleh oleh peneroka tujuh tahun kemudian!) yang umumnya melibatkan golongan bukan Melayu serta-merta menyejat peruntukan jutaan ringgit itu. Inilah yang dikatakan oleh Tun Razak dahulu bahawa DEB yang memperuntukkan 30 peratus kepentingan Melayu dalam semua sektor dalam tempoh 20 tahun untuk dicapai bukan bererti merampas daripada bukan Melayu kepada Melayu, sebaliknya ia dilaksanakan dengan memperbesarkan kek ekonomi. Walaupun sesuatu projek itu diluluskan atas tajuk Melayu namun nikmatnya tidak semestinya dirasai oleh Melayu sahaja." Mungkin baik kita fikir bersama perkara ini. Diakhir ucapan Tengku Razaleigh, beliau telah mengemukakan cabaran: “Apakah kita mempunyai apa-apa pilihan atau “model” lain yang dapat menggantikan wawasan Razak itu sebagai formula yang terbaik untuk memajukan negara ini atas LANDASAN PERPADUAN NASIONAL YANG SEBENAR? Maka pengakhir kata Dr Nordin pula boleh saya anggap sebagai persoalan mengenai LANDASAN PERUNDINGAN YANG SEBENAR. "Saya teringat kata Profesor Bazerman, pakar strategi perundingan Harvard yang menyebut jika ada dua pihak sedang berunding yang kesudahan rundingan itu satu pihak mendapat lapan dan satu pihak lagi mendapat 10 tetap lebih baik meneruskan rundingan berbanding jika setiap pihak mendapat masing-masing tujuh jika menamatkan rundingan. Dari sudut politik, sehingga semenjak 1955 sehingga pilihan raya 2004 orang Melayu masih setia memberi apa yang mereka biasa beri. Ini akademik. Mungkinkah Profesor Bazerman pernah secara diam-diam belajar dari Malaysia?" Tidak mudah untuk menahan seseorang untuk memikir dan memberi keutamaan kepada kepentingan diri sendiri, keluarga, masyarakat setempatnya, kaumnya dan pelbagai lain entiti. Yang penting, jangan kita tidak ambil endah fikiran kepentingan orang lain. Banyak yang boleh dipersoalkan nilai keilmiahan buku kontroversi Dr Kua Kia Soong, May 13, tetapi mungkin biarlah pakar-pakar ilmu yang melakukan. Buat diri saya, buku ini jelas sekali adalah satu usaha "historical revision" berdasarkan teori konspirasi igauan penulis untuk menidakkan usaha murni seorang pemimpin besar Melayu yang saya amat kagumi kesinambungan jasanya yang kekal hingga ke hari ini. Seterusnya adalah artikel sumbangan saya bertajuk "Teori Konspirasi, Kajian "Tangkap Muat"" sebagai penulis jemputan untuk Team Blog reaktif bernama "13 Mei: Dari Kacamata Melayu" (sila rujuk di sini) yang disiarkan semalam. Tiada lagu hari ini, hanya kata-kata. Sebenarnya bukan kali pertama saya mendengar teori konspirasi Tun Abdul Razak bertindak di belakang tabir untuk menurunkan Tunku Abdul Rahman dari jawatan Perdana Menteri. Mengikut teori konspirasi itu, kacau bilau kaum ini dirancang untuk membolehkan pemerintahan mageran yang boleh melemahkan dan seterusnya memaksa Tunku Abdul Rahman melepaskan jawatan Perdana Menteri. "You know Harun was one of those - Harun, Mahathir, Ghazali Shafie - who were all working with Razak to oust me, to take over my place ..."
Kata-kata Tunku itu merujuk kepada buku "K. Das & The Tunku Tapes", penerbitan SIRD tahun 2002 yang bukan secara kebetulan disunting oleh Dr Kua sendiri. Sepanjang yang penulis ingat, kesahihan "The Tunku Tape" amat diragukan para ahli ilmiah. Dizaman itu, rakaman menggunakan reel tape dan menyimpan “collection” rakaman adalah agak mahal dan merumitkan. Jika dikaji peristiwa dan susunan masanya yang agak cepat berlaku, tidak mungkin ia boleh dirancang dan diselaraskan. Pada tahun pilihanraya 1969, pembuangan dan keputusan undi adalah pada 10hb Mei. Mengikut buku yang berdasarkan catatan diari Tun Dr Ismail, “The Reluctant Politician”, kempen pada tahun itu banyak menyentuh sekali isu-isu perhubongan kaum, bahasa dan hak istemewa. Suasana memang sudah sedia tegang. Calon pembangkang Dr Tan Chee Khoon dari parti Gerakan telah menang di kawasan Batu, Selangor dan telah mengadakan perarakkan yang agak provokotif terhadap orang Melayu pada berikutan hari Mei 11hb. Keesokkan harinya, Mei 12hb, perarakan mayat di Jinjang, Kepong telah berubah rupa menjadi perarakan kemenangan yang mana berlaku provokasi terhadap orang Melayu. Sepanjang 3 hari hingga Mei 13hb, pelbagai perarakkan kemenangan pembangkang berjalan yang melampaui kawasan Melayu dan mengejek mengeji orang-orang Melayu. Keputusan agak menakjudkan untuk Perikatan yang menurun dari segi undi popular dari 58% ke 48% dan kekalahan 23 kerusi parlimen yang banyak menjejaskan MCA. Pada hari berlaku kejadian, banyak urusan sedang dilakukan dalam menubuhkan kerajaan. Hari paginya satu perjumpaan antara UMNO dan MCA telah diadakan untuk membincangkan susunn kabinet. Tunku dijangka akan membuat pengunumannya. Pada tengahhari itu juga, Perikatan telah dapat menubuhkan kerajaan negeri minoriti untuk Selangor. Setelah amat marah dan tertekan, orang Melayu telah pergi berkumpul di hadapan rumah Dato Harun pada petang itu. Pencetus kemarahan orang yang berkumpul untuk mengamuk adalah peritiwa sebuah kereta cina yang lalu sambil memekik kata-kata kesat dan kecaman. Keganasan mula berlaku pada pukul 6:45 ptg dengan orang ramai membelasah dua orang Cina bermotosikal. Dalam temuramah dengan Tun Hanif Omar untuk buku “Reluctant Politician”, beliau memberitahu bahawa Dato Harun sendiri dilaporkan jatuh pengsan apabila mengetahui keganasan berlaku dihadapan rumahnya. Dalam pukul 8 malam, perintah berkurung dipanggil. Orang Melayu hanya reaktif kepada provokasi. Darurat telah diumumkan pada Mei 15hb, 2007. Pada mulanya, Tunku mahu mengumumkan pemerintahan tentera tetapi telah di nasihati suapaya mengumumkan darurat. Banyak sumber-sumber yang sahih melaporkan Tunku Abdul Rahman menolak dan meminta jawatan Pengarah Jemaah Operasi Kebangsaan (atau pendikkan Inggerisnya NOC) diberikan kepada Tun Abdul Razak kerana pengalamanya dalam urusan keselamatan dan situasi kesihatannya sendiri. Pendik kata, Tun Abdul Razak sendiri tidak melakukan coup d’etat. Walaupun pihak pemerhati barat diketahui membuat andaian Tunku telah hilang kawalan kuasa, yang menjadi asas andaian Dr Kua, perkara itu jauh dari kebenaran. Tun Dr Ismail yang menduduki jawatan Timbalan Pengarah NOC adalah seorang yang amat tinggi integriti untuk tidak melangkaui ketua dan Perdana Menteri. Dia sendiri masa itu dijemput balik ke kabinet oleh Tun Abdul Razak dengan persetujuan Tunku. Karl von Varys dalam bukunya, "Democrasy without Consensus", memetik sumber-sumber yang mengatakan NOC tidak membuat keputusan penting tanpa persetujuan Tunku. Selain itu, apa mungkin Tun Abdul Razak menjadi perancang peristiwa berdarah ini, jika ia sangat bersungguh-sungguh untuk mereda dan meleraikan keadaan. Dalam satu temuramah Harakahdaily dengan bekas Senator PAS pada Mei 18hb baru-baru ini, Ustaz Hasan Shukri memberitahu Tun Abdul Razak meminta beliau memujuk para pejuang yang sudah pun berkumpul di Kuala Selangor untuk 'turun mengamuk' di Kuala Lumpur. Beliau juga menyatakan Tun Abdul Razak mengambil sikap menghormati dan mengambil kira pandangan pimpinan PAS ketika itu untuk menyelesaikan masalah negara yang pada ketika itu amat meruncing. Kalau dikaji, adakah munasabah Tun Abdul Razak mengatur parti pembangkang Cina untuk menimbulkan isu-isu sensitif semasa kempen pilihanraya dan seterusnya perarakkan kemenangan? Adakah munasabah untuk merancang kejadian-kejadian provokasi selama 3 hari yang menimbulkan kemarahan orang Melayu? Adakah munasabah adanya komplot sedemikain sekiranya beliau sendiri telah turut terlibat meminta melembutkan orang ramai. Jelas sekali kesimpulan fakta Dr Kua itu hanya satu usaha “tangkap muat” untuk memenuhi hipotesis konspirasi dan perjudisnya untuk mencemarkan nama baik Tun Abdul Razak yang merupakan seorang pemimpin Melayu yang sangat hebat dan perancang Dasar Ekonomi Baru. Malukan pencetus ide untuk menidakkan jasa dan usaha-usaha pembangunan negara dan luar bandarnya. Damn referee! I bloody hell saw the ball held by goalie past the goal line! There was no foul call on Giggsy's lunge in front of goal. Ryan Giggs claimed Manchester United had been harshly treated in the FA Cup final after his extra-time effort was ruled not to have crossed the line. Sir Alex Ferguson's side missed out on the double after Didier Drogba's goal five minutes from the end clinched Chelsea's 1-0 victory at Wembley on Saturday. But United captain Giggs insisted it could all have been so different for the Premiership champions if a linesman had seen that his close range shot was over the line. United felt aggrieved as they also claimed Giggs was pushed and should have been given a penalty before the Wales winger collided with Petr Cech, who then carried the ball over the line. "We felt that we played well and just edged it," Giggs said. "If that goal had been given it could have been different. "I knew it had crossed the line. I couldn't understand why it wasn't a goal. Obviously we're disappointed. "You just hope on a day like this they get the big decisions right and on the day he didn't. I think he [Cech] was looking for the players' reactions and he knew he had got away with it." In truth, the phantom goal could have been disallowed anyway as the Giggs challenge that forced Cech and the ball over the line looked a foul. 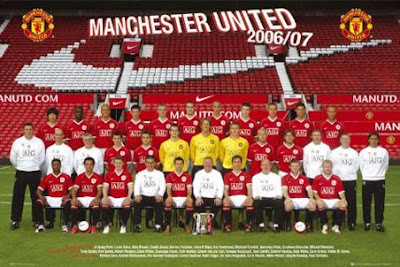 Rio Ferdinand admitted that the luck wasn't with United and said: "Maybe it wasn't meant to be. I've not seen Giggs's one yet but that's how it goes. "That's why cup finals are interesting because decisions go this way and that. They are always controversial. "I saw Ryan's reaction on the pitch, but I was too far away to see if it went in. If the officials were doing their job they would have made the decision that it was over the line." Despite a defeat that will leave United with a bitter taste until next season, Giggs is convinced his side have plenty of positives to take from a match that they had the better chances to win in normal time. "We can take a lot out of the way we played," he said. "We said at the start of the season the Premiership would be our number one aim and we've managed to do that, but I thought we deserved something out of the game. "We've come so far. We nearly did the double. Each season you look to move forward. I'm sure there will be new signings and the young players will get better. There's a lot to look forward to." United's Serbian defender, Nemanja Vidic, insisted tiredness was not a factor despite both sides producing performances that were well below their best. "We played a lot of games this season and it is normal to be tired, but we were no more tired than Chelsea," he said. "We had a couple of chances to win it. "At the beginning of the season we wanted to win the championship and we have done that. We are not happy because this was an historic game at Wembley and we lost it. Okay, I'll be a sports. You guys played better. Your defense did well. Your offense could have put us a way earlier. So, congratulation is in order for your "3rd placing". The "finals" is this upcoming Wednesday! The other cup is already ours. Rocky, the All Blog Protem President was invited to appear on RTM2 program Fast Forward on Tuesday May 15th, 2007 8:30 p.m. 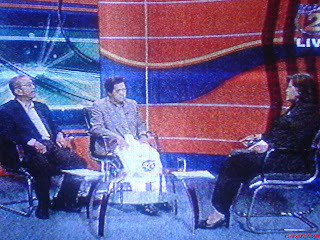 The program intended to talk about Press Freedom and he is appropriate a person to discuss about it. By midnight, he got to know that the program was postphoned. Read his posting here. By Tuesday, it is obvious that he was dropped (as he update it here). The program was not postphoned. In fact, the originally planned panelists, The Sun's Zainon Ahmad and Bernama's Azman Bujang (via the phone) was present, together with The Star's Bunn Negara and the host Hamidah Hamid. Rocky felt that he was dropped because his earlier presence on Hello On Two some two weeks ago was too hot. Thats partly true but frankly Rocky, I believed it is more to do with his Sunday posting on Pak Lah's alleged "pengsan" or "pitam". Arising from that incident, he was attacked by Pak Lah himself, Tan Sri Muhammad Muhammad Taib, Dato Shaziman, and Dato Lim Keng Yaik yesterday. Pak Lah and Muhammad Taib's response were merely forms of denial. Of all, Dato Shaziman expressed the strongest of words. He spoke of using Penal Code, if there is any element of slander. He mentioned of applying the CMC Act which could result in a RM50,000 fines and jail term. Strangely, his comments were made without reading Rocky's posting. His boss, Dato Seri Lim Keng Yaik was more realistic in his response yesterday. "There is nothing we can do. What you want me to do? Block the whole thing? If they break the law and we know who they are, we will go after them." Thats exactly what we have been saying. Just like the existence of NST and TV3 in the mainstream media, it also exist in the Internet. Let the consumer decide. I am sure they are wise enough to know and decide. Dato Lim mentioned of request by "... minister you have to stop this and stop that." But this was his reply, "I can’t stop because knowledge, good or bad, come together.” He added, which is good advise for his Deputy, "Through the Internet, you select the knowledge and not the minister who pushes the knowledge to you." By the way, TV3 insinuated Rocky as making "fitnah." Perhaps, lets all read again Rocky's posting (refer here) and decide. Lets also listen to Pak Lah's own words below or at http://www.youtube.com/watch?v=W5TAs51Cwi8. Did Rocky fabricate or "fitnah" as TV3 described? Whether Pak Lah "pengsan" or "pitam", Rocky reported it professionally and even did the necessary updates. Whats the fuss? Where's the beef? Damn you people! Give Rocky a break! Isn't his plate already full with NST and the four rectums' lawsuit. We understand that information like this is serious s**t for it affects the head of Government. Wiser head should have prevailed to avoid commotion and possibly panic among the general public. Lets look at a recent revelation of the past. Should we be putting under wrap the illness of the late Prime Minister Tun Abdul Razak that led to his death? A physically impaired Prime Minister can seriously make wrong decision and have his decision made by some insiduous characters around him. Can we take that kind of risk? Think about it! If last Friday’s All Blog session with Dato Seri Anwar Ibrahim could be beyond just a PR exercise and get-to-know session, “the answer” would be my ideal expectation. That could be a hint of how he resurrects his political career, after being so close to the pinnacle of power, then to hell and back. The bloggers were polite and perceptive to his request for “gimme me a break” from questions on past issues and alleged “perception created by the media” like the “American…” link and all. We are quite a civil bunch to understand that it is rude and poor taste to be adversarial to ones host, who has been hospitable and provided us this opportunity. Having to resist many temptations to ask more provocative questions, I kept "Rambling On My Mind" throughout the session. As one experienced in government, opposition, and activism, I felt Anwar was merely giving “an answer” of what was wrong, and what we are not. Our discussion dwelled on current political affair. Most of his answers and position are similar to his public statements. So I’ll highlight the ones I find interesting. The first issue asked was about his relationship with Raja Petra Kamaruddin (RPK), the papa blogger as some are calling him that was behind his Free Anwar Campaign website and now Malaysia Today. After the complimentary words, I picked some interesting words like “expected” obligations, “commitment that could not be fulfilled” and he “had no choice coming out of prison”. My rambling mind was screaming inside wondering why the bloggers were quiet. Perhaps, some are still in awe or still in their polite mode to leave this issue hanging unpursued. Probably, many of us there did not have any idea what it was about. Expectedly, the issue of Ijok by-election cropped up many times. When asked, if the Ijok by-election loss was the beginning of PKR's demise and the end of his political career, he was somewhat deflecting it with allegations of massive cheating and denial to speak at political rallies. He even claimed Tun Dr Mahathir supported them. That claim was refuted. He replied with compliments of Tun’s intelligence, grasp and understanding on issues. Perhaps, he was testing the influence of Tun on this set of bloggers. That brought about a question for him and Tun to patch up. Strangely he said and I quote, “I told Al Gore the same thing recently … lets move on.” He then described of his chance meeting with a former judge at an Airport and said “Sudah-sudah … move on” when embraced. My rambling mind was trying to figure out whether Al Gore was an endogenous or exogenous variable in this equation of Anwar Ibrahim. Perhaps, he is a statistical outliers? If he is forgiving and moving on, I wonder why the need for that lawsuit on Tun. He did touch on it which I heard as words to preempt in the event the lawsuit is thrown out. He acknowledged it is not easy. Rocky steered him out of that difficult position to say Dato Seri needs to stay for the long run. Somehow Dato Seri seemed to have a restless eye that day and he frequently looked at Rocky. I was rambling and thinking that this is a bet everything situation for him. There were issues raised about him holding back personal criticism on the Prime Minister and yet his campaign against Dato Najib in the Ijok by-election was personal. There was a more serious tone to his voice as he denied both allegations. While he acknowledged “you (all) are more critical of Abdullah than me,” he clarified that he has stated in "strong terms" like incompetent and corrupt to describe Abdullah’s administration. My rambling mind was telling me that without specifics, such general accusations is meaningless in Malaysian politics. This is where lies the rising conspiracy of a covert agreement between Anwar and certain parties within UMNO. He mentioned about some interesting request he gets from family members back in Permatang Pauh that “interlock” with Pak Lah’s. He was asked to hold back his criticism of Pak Lah for reasons he is an Ulamak’s grandson. The typical rural Malay mind. On the issue of being personel with Dato Najib, Anwar insist that it is not and highlighted that he has documents to support his allegation. I was quite aware of issues raised by Rustam Sani (read here) regarding the polemics betwen Ahmad Zaki Yamani (read here) and Anwar. My mind was rambling and remembering his defiance words “saya tak takut” from any lawsuit and to discuss issues deemed sub-judicial in public. One blogger raised interfaith issues. He commented more on the attitude of both PAS and the “super liberals”. He claimed Malik Imtiaz refused a dialogue with the Muslim groups. My rambling thought was that he fell short from stating his position. He was merely giving a politically correct answer for a need to hold a talk. As it is, certain quarters in ABIM, PKPIM and former Keadilan expressed their impresion of his pro-Article 11 leaning. There was one suggestion for PKR to aim for state control. Expectedly, Anwar said about looking at holistically. My rambling mind was reminded of Keadilan’s aggressive move in Sabah and an issue raised by blogger Rudin X on Kelantan (read here). That is “a damn if I do and damn if I don’t” situation. Understanding a seasoned and polish politician and former student activist like Anwar requires more than merely his spoken words. Maybe one need to know what is not answered and how it is answered. “The answers” I had hoped for came towards the end as he announced the Kongres Nasional Tahunan Pemuda Ke 4. Now I understood what the request for today’s session was for. Anyway, he said the emphasis of discussion at the Convention will be on Economics and Election Commission. I understand Economic as manifesto and Election Commission as election strategy. When Tony Blair’s quote was mentioned, he said of the need for a clear agenda and to deny Barisan Nasional’s 2/3 majority. That he felt would bring about the dismantling of the system he deemed as corrupt. He expressed PKR’s economic agenda of dismantling DEB and improving the deteriorating International benchmark of Malaysia with regard to corruption, competitiveness, and government financial management. Affirmative action based on race was to be removed and for a more transparent program. He felt poor Malay would benefit, without poor non Malay being denied. There would be special program for Malays to improve their education and competitiveness. My rambling mind was asking. Isn’t that also DEB? Isn’t that also in Article 153? PKR’s proposed an economic agenda to, among others, “bite the bullet” and embrace globalisation. Where did I hear that? Isn’t that the sound of a familiar bell from a distant past and is already ringing loudly these days? It is a good intention to “baik sangka” and give him a break but remember the lesson we should be learning now. Leadership of this country is a decision that needs careful and thoughtful decision. If Anwar is serious and sincere on all these issues, there are many ways he can play his roles. It doesn't have to be only in politics. Yes, Anwar, lets move on. I'll be waiting for "the answer" of yours. Telekom, Does It Have To Be Sooo ... Complicated? I have been cut off from the world for more than a week. No, I was not stranded in a Pacific island. I had a telephone problem. This automatically affected my streamyx service. With me still boycotting to buy NST and other main stream media, that means I was also cut off from news. Worst of all, I am denied from blogging. Already earlier my phone was suspended for a few days. That was my mistake for being late on my payment. That late Saturday afternoon I was writing stuff in this Blog, but I can't publish it. The Internet was disconnected and all those writing lost. I didn't save it earlier. When I checked my telephone, it was absolutely dead. I immediately called using my handphone a nearby electrician to come over. He can't do it. I was told they are not specialist in telecommunication. Best to get a specialist contractor with Telekom. I was told to call the 100 number. I did exactly that and requested them to send someone over to the house first before starting work. I don't want them to tinker away brainlessly, without meeting me. In a minute, an SMS with my report detail came in. Wah ... efficient. So I'll have to wait out through the weekend. Come Monday, I called the 100 number again and gave them the report number. They asked me for details and my problems. I thought I just gave my report number, whats the problem? Do I hate aimless repetition? I refused and told them, "My life must be convenient becasue I am a customer. You are supposed to be inconvenienced. I am sure by punching those number somewhere, you can retrieve even my mother's name from that. Go do it." After a while on the line, the lady answered, "Yes, we have your detail. Sorry." They actually can do it. Why the heck did they have to ask me all that, I thought. Before I could say anything, she informed me, "There is a cable problem in so-and-so place. It'll take a couple of days." I repeated my request to have someone over to see. "No sir, we can check through our system. You do not need that." I wanted to check how the status of the cable problem. After being asked to wait for quite sometime, my phone card ran out. Only did I realised that calling enquiries with your handphone to Telekom, even for a 013, is charged. What is not charged now? So I had to call from another place. I already assumed the public phone downstair is not working. When I got to call them, their reply was, "You must be patient, fixing cable problem may take few days." The same lady from yesterday said. "But I just want Telekom to send someone over here first..."
I waited throughout the day, and no calls supposedly to make arrangement to meet me came in on my handphone. Coming down the elevator in the morning, I met one of the friendlier neighbour. When asked how his telephone was, he answered "OK, no problem." "You mean you never had any interruption of service since Saturday?" I asked. "No", he said. Hmm... strange, I thought. That late afternoon, I decided to knock on few neighbours on my floor to enquire of their telephone. All gave good responses. Duck it! In my mind, I was wondering, what the heck is Telekom doing? I borrowed my neighbour phone to call the 100 Telekom number to ask. Their response, "I don't know. That is what the system tells me. They are fixing a cable fault at this so and so Taman." "How come this next door neighbour of mine's telephone is ok? Do you know the cable fault you mentioned is so far away from my place?" I was building up fume. "I will have to call you back on that. I do not know of your place." She replied. "Where are you located?" I enquired. "Aaa ... Penang?" Only then I understood my complaint is being handled by someone in Penang. They share the incoming enquiries with the centres in Kuala Lumpur and Kuching. "Ok then please call me. I want to know what happened?" I SMS my wife around noon and requested to call from her office. Save my pre-paid phone. Same script of questions was asked of her. Being polite and her usual over obliging, she decide to redirect them to call me. Sometime in late afternoon, my wife SMS me to tell that Telekom told her the telephone is OK. I asked her, "How do they know? I am in a meeting somewhere and you are at work. Did they break in?" Eventually, the Telekom people called me to tell me, "The cable problem is solved and your phone is ok." I was already home by then and responded, "Good for you but my telephone does not work and there is no tone at all. You heard my repeated request right. Get someone over tomorrow morning first. This time, make sure its in the morning." I have Friday prayers around 1:00 pm and something (All Blog event) at 3:00 pm. Its 9 am and there is no one knocking on my door. I have no more patience for I'll not take chances with these leg dragging people. I seek for my neighbour's phone and called for the same lady. By the time I got to the person, I asked her, have you called and inform the contractor. "Yes, I did this morning", she answered. "This morning? I told you to tell yesterday. How do expect them to come here in the morning when you only inform in the morning? Do you know how long I have been waiting to get my phone fix ...." I was no more containing myself and giving her a lecture on telephone etiquette, keeping customer's informed, planning, not taking your customer for granted, .... and just stop of teaching her about existential philosophy. Soon, after some 5 minites hanging up, a contractor called, "I was just told by Telekom. I can't come right away. But I am aware that you need to leave by 1:00 pm. We'll try to see you at 11:00 pm." "Don't try please, just come by 11 pm"
"Yes we will", the Contractor said. "We will fixed it before the day ends." "Sure ..." I said sceptically. By 11:30 nobody came over, I called the contractor on my handphone. "Where are?" "I'll get my people to call you. I am in Penang." The contractor answererd. Penang again! A call came in around 11:45. His staff told me, "We are fixing something here few blocks outside the building." "Can you come over to the house first? I've asked Telekom to see a human since last Saturday", I was growing impatient. "Ok Ok bang, I'll come right away." By the time, he came over, it was already 12:15. I had to ready myself. "Can you check if the lines are OK in here first? Telekom have for many months not been helpful to solve my streamyx and telephone set-up. I can't find the spliter model they gave me and their service hotline people don't even know where I could get it." "Saya tak dapat buat tu. Kami cuma pastikan tone saja." "The line is a different people lah?" "Yes, line different, data or streamyx different, and tone different. After I get the tone in than I can help to check for the other matter." This sounds like 3 set of Telekom people and several set of contractors to change a light bulb. "That will take time. That was why I asked you to come early so I will be around for you to enter and complete the job." I said. "OK lah just finish the job. I wait as much as I could." After a while, I had to leave. Sometime in evening, around 5-6, a Telekom people called. "Encik phone you dah ok."
"Macam mana you tahu? You heard my phone rang?" I was never gonna believe it. When I reached home, again there was no tone at all in my telephone. Hell broke lose. I text the contractor's boss in Penang. Around 9:30 someone came, his supervisor came and went around tentatively looking through my lines figuring out why. Until he located a line around our door. I came right away. "Ya"
"Someone cut a piece of your phone line and even hid the end so as not to be detected. Look! When I connect this phone to the line, this phone works. Where is the other end of the phone?" "So what I you planning to do?" I asked. "I am not a line contractor, so I have to inform Telekom of this. I'll get to the nearest Telekom maintenance office at this Taman and first thing in the morning, someone will come." "From day one, I asked Telekom to send someone over. Why is Telekom so phobia about meeting up its customer?" Another contractor called, "Can we come over maybe around 11:00 am?" "Lets promise and not do maybe. 11:00 am is fine." I agreed. Right on time he came. The guy is quite a jovial and confident chap. "You sit down and leave it to me." He said. I saw him throw away quite a bit of external phone lines and after some half hour, everything is fixed. Offered him some drink and he told me the same exact thing about a sabotage. I told him about what I went through and this is the first after almost a year, that my phone and streamyx is finally proper and working. He told me I was lucky. One Dato after making calls to powerful places, could only sort his telephone after week. Problem lies with Telekom and their maintainance process. Contractors only get instruction. We are specifics in our role, so now this add to the slow response when it involves more than just the tone, or data/streamyx or wiring. A lot of the experiacned ones left, this is the effect. I understood. The cost cutting undertaken as part of Telekom's GLC reform to generate more profit must have set an arbitrary figure to reduce maintenance cost and this affected service. "Those days one team can fix some 40-50 house a day. Now the Telecom team can only do at best 20 a day. We contractors just take orders when called on." He continued. I told him, "The last time I had a customer service problem like this, I actually SMS someone high at the top. He apologised and ask for the detail to help but I refused. Its not his job to do menial matter like this. I only wanted to give a feed back and remind him that customer service means immediate service, least customer inconvenience, communication, and service beyond expectation must be there. His answer was "That is what it is supposed to be and not the way it happened."" My thought was even when you are high up, you must learn to bother and follow through your expectation. Check even on your top management people. Command and control is not sufficient. Find ways to know of the grouses from the ground. Don't be in a habit of being defensive. Being at the top means leading and managing, not being held up doing papers till late at night. That is the problem with Malaysian corporates. We are run by Lawyers and Accountants with Civil Servants as Chairman. Civil servant are bereaucratic. Lawyers only the law and nothing but the law. Accountants are only concern about bottom line and technical efficiency, human touch, and quality of service is secondary and confined within profit target. See, if most major Global Corporation, other than International Law and Accounting firms, make a habit of placing Accountants, Lawyers, and Civil Servants as CEO? And the sabotage? Heck with it, am I supposed to be afraid? I am not gonna be a kepoci to make posters and drama out of it. Since the end of Ijok by-election, I've kept procrastinating to write my analysis of it. With many commentary and analysis already made on the blogs, its pointless to repeat the same thing. I am reluctant to pursue in what is already obvious and well said by Ray Charles, "Hit the Road, Jack (PKR)!" I decide to make an exception to republish an opinion by the Goodbye Girl entitled "PKR should find out why it lost" in The Star today, May 4th, 2007 for it caught my attention and worthy to republish here. There is too much blame game post Ijok that it begs the question whether PKR or the Opposition at large understand and serious in their role and the relevance of their existence. She started out with a plea for a reality check by PKR. THE Opposition’s lament about electoral fraud, intimidation and violence is even more tiring than a broken record. Especially so after losing in the recent state assembly by-election in Ijok. As usual upon defeat, the Opposition will cry “foul” and point to a “dirty election” but when they win, they are strangely silent. Why not cry foul after Lunas or in Permatang Pauh, where Parti Keadilan Rakyat president and only Member of Parliament Datuk Seri Dr Wan Azizah Wan Ismail retained her seat after a recount. All the allegations about the Barisan Nasional (BN) using government resources, "importing” phantom voters and using police intimidation to win elections are nothing new. She posed a pertinent issue of Indian segment vote, which PKR was not able to secure. PKR must now face the fact that it lost the Ijok by-election because it failed to secure the Indian votes which consist of about 3,000 or 28% of total votes. If it had received just 30% of these, this would translate into 1,000 more votes for PKR. BN was able to secure solid backing from the community after MIC president Datuk Seri S. Samy Vellu went down to the ground to campaign door-to-door twice. Of course, there were the free sewing machines and 800 land titles but PKR should look beyond these and ask why they failed to get any Indian vote; the other communities were similarly “pampered” by the BN and yet they voted for PKR. Much throughout the campaign, PKR was using hooliganism as excuse to blame BN. I doubted it as total truth and believed it is a one sided view. She echoed my earlier observation here. I was there for most of the campaign period and witnessed the hooliganism on nomination day. To solely blame BN for violence is inaccurate for PKR supporters shouted insults directed at Umno Youth deputy chief Khairy Jamaluddin and at Umno Youth chief and Education Minister Datuk Seri Hishammuddin Hussein. Throughout the campaign period, PKR supporters displayed an inclination for provocation and violence, such as stopping Deputy Prime Minister Datuk Seri Najib Tun Razak’s car on polling day and taking the law into their own hands to "arrest” alleged phantom voters on board two buses. Those who claim to fight for the rule of law should respect the law. I commend her fair-mindedness and honesty. However, I will blame on Khairy's immaturity for responding negatively to such provocation. When you come unprepared and lost the psycho game at nomination day, one take the high ground to play noble. However, I did not see Khairy toning his act after the first day. Shouldn't he realise the implication to BN? The incident to Jeff Ooi & Co.? Isn't he providing fodder for the opposition? She then continued to raise the hypocrasy of racist accusation, conflicting ideologies, and the recalcitrant ideological postures of political parties. PKR has also been calling BN a racist party, but in Ijok the BN proved that it believes in power-sharing and supported an Indian candidate despite calls from Umno for a Malay candidate in the Malay-majority constituency. 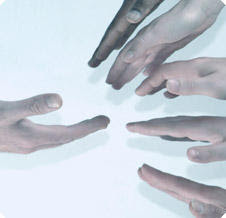 The different component parties also worked together with a single cohesive ideology to secure victory. The Opposition is still swimming about in a pool of conflicting ideologies – DAP fights for a secular state, PAS for an Islamic state and PKR for Datuk Seri Anwar Ibrahim. For them, the battle for Ijok somehow became a battle between Anwar and Najib. Then somewhere along the line, to secure Chinese votes, Anwar proclaims "wo me do ze yi jia ren"(we are now one family) to the Chinese and supports vernacular education. Anwar and PKR's campaign at Ijok (and Machap) demonstrated total disrespect for the subjudice law on an on-going court case and made unsubstantiated accusation towards Dato' Seri Najib. None of the big guns of BN came in support to dispell the accusations against Dato Seri Najib. The strange missing link of this campaign is why not a single "in the bag" issues involving the Prime Minister, his son and his "son-out-law" like ECM Libra, Scomi, Oil for food, ISA on BSA Tahir, etc. raised? Why is it that PKR, and also DAP, refused to raise these issues in their campaign? Political pundits are putting Khairy's behaviour in Ijok and the reluctance by Opposition to question the PM, as a conspiracy of the highest order to preserve the ineffective and weak leadership of Abdullah Ahmad Badawi. Perhaps, they feel that preserving him would serve their purpose. Yes, their purpose and not the people and country. Finally, she asked the most relevent concern that the Opposition chose to ignore - the people. But what alternative would PKR be offering in terms of government; and to Ijokians, how their lives would be better with PKR in the state assembly? take a good hard look at why it failed to win the Ijok by-election. Unless the Opposition could honestly appreciate the people without overindulgence in polemics and rhetorics, they will continue to be insignificant. Can you blame me for my support and belief in BN? At the end of the day, it will only be within UMNO lies the will and solution to address the nation's predicament. I will always remember Ijok for the incident of meeting two representatives from the American Embassy political desk. For a political party on the slippery slope to irrelevence, the American expressed great attention on the political development of Dato Seri Anwar Ibrahim and PKR at Ijok and Machap. God as my witness, my ears didn't deceive me!